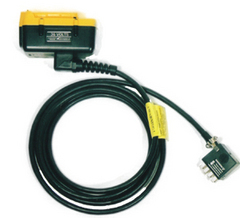 Robopak power tool adapters and connectors provide the proper connection and voltage from a Robopak to the tool, light or equipment that is being powered. Each adapter or connector is extremely durable containing a heavy-duty strain relief system, military type cord, and a proper voltage program plug that fits easily and securely into the super amp hour Robopak. Robopaks and adapters make your DC tools, lights and equipment better, allowing them to stay portable and also provide super amp hour capacities for "extreme"run times. Aircraft Dynamics also offers a CUSTOM ADAPTER / CONNECTOR PROGRAM. 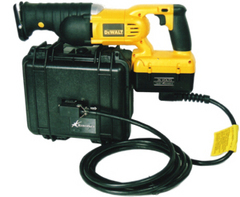 Simply supply us with a cordless battery or connector for your equipment and we will convert it for use with a Robopak!